Really, what tropes are there left to mine in the musician biopic? The most talented performers have the biggest pathologies, so by movie’s end, they’re all either dead (La Vie en Rose) or redeemed (Ray, Walk the Line). 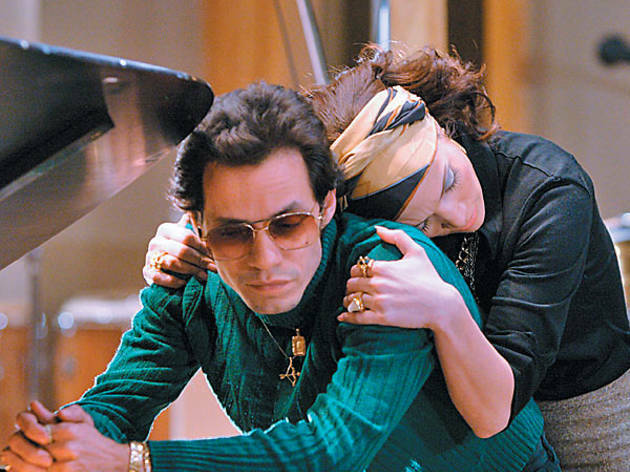 But what might happen when two real-life recording artists—who are also married—sign on to do a docudrama about Héctor Lavoe, the salsa legend who died of AIDS in 1993? If one of them is Jennifer Lopez (who also produced), a whole lotta mess. Simply put, Jenny does not like to cede the spotlight. The life of Lavoe (Anthony) is structured around his wife, Puchi (Lopez), remembering the good and bad times nine years after his death. In reality, Puchi had very little to do with Lavoe’s career. Anthony, for his part, admirably plays the salsa king as a dandyish crooner—sort of like a Thin Brown Duke. Yet he simply can’t steal enough oxygen from Lopez (who does at least wear really great head scarves), even though all the melodramatic moments (OD’s, nervous collapses, suicide attempts) belong to him. But only Anthony sings, and in these moments, the movie is magical. Who knows what Lopez will do when the two of them tour together this fall?